Decision trees examples and how to draw them. Decision tree analysis. Below are some decision trees examples in order to introduce and explain decision trees and demonstrate how they work. Decision trees are predictive models, used to graphically organize information about possible options, consequences and end value. They are one type of decision support software used in computing for calculating probabilities and data mining, and the decision trees examples below relate to 'simpler' decision making, so to speak. 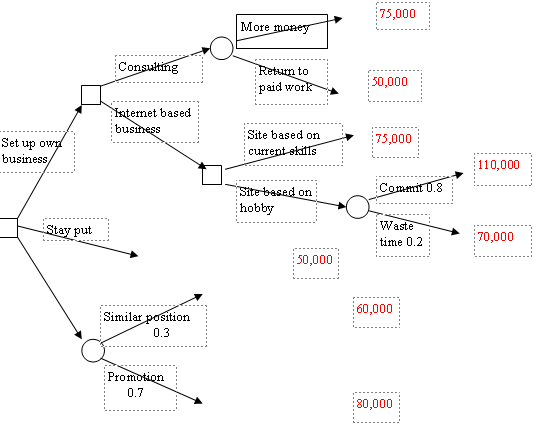 Decision trees are used for deciding between several courses of action. They create a visual representation of the various risks, rewards and potential values of each option. Start with your decision and represent this on the left side of a sheet of paper with a small square. Then, for each possible option, draw one line out from the square towards the right. Leave plenty of space between these lines. Write each option on it's line. Then take the lines one at a time. At the end of the line, do you get a particular result, or is it uncertain or is there another decision to be made? If it is another decision, draw a square. If uncertain, a circle, and if a result, draw nothing (sometimes triangles are used for results). Review the diagram and if there are any more options, fill them in, too. Each of the end values is recalculated in this way. It's also useful to add in any costs that will be incurred along the way. This gives a more accurate picture of the net value. Decision trees are frequently used for major, complex decisions such as times of major re-branding in organizations, or deciding whether to expand or not and in which directions. 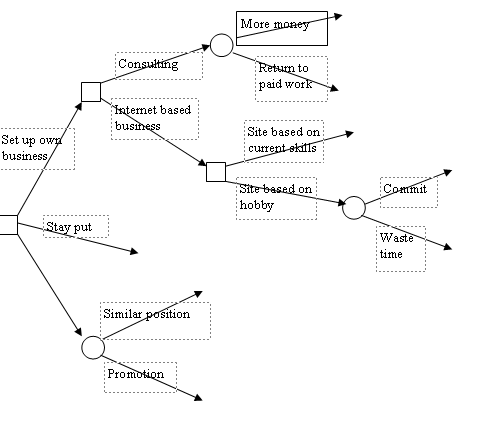 Decision trees clearly lay out the situation so that each and every 'node' can be scrutinized. Many possible consequences can be worked through. Information available can be used to give clearer and more accurate assessments. For those who like software and pretty computer printouts, there are addons for excel that create excel decision trees quickly and easily. One of the dangers of course, is that the decision never gets made because so much time is put into creating pretty pictures. The decision trees examples here can just as easily be drawn by hand. And remember the computer is not making the decision. The information put into the tree will determine the results. And, of course, this is influenced by the required outcome and the questions asked about it.